Lindsay Erin: Goodbye Second Trimester, Hello Third! 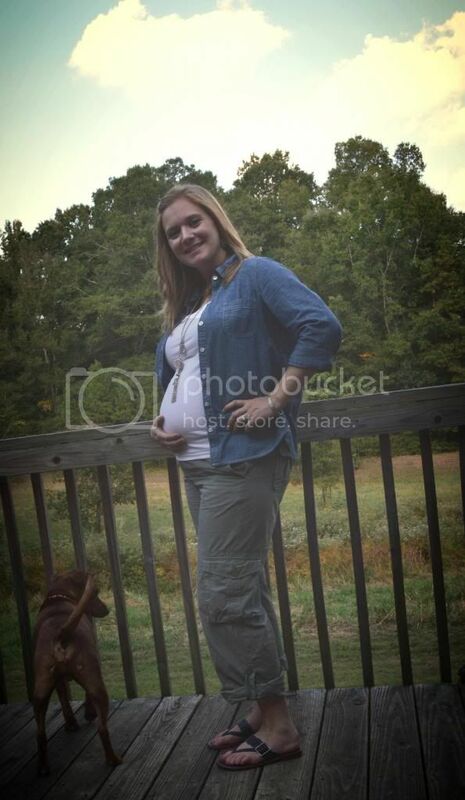 Maternity Clothes: Loving that fall weather is allowing me to break out my boots with some of my maternity dresses. I also purchased a pair of skinny jeans and a dress from Old Navy, but I have vowed to my husband (not by his request - by my own) that I will not make any more maternity purchases unless I find a good deal at a thrift store or something because it won't be too much longer and I will be able to wear normal clothes again! I know that I might not fit right back into my pre-baby clothes and I'm totally okay with that, but I want to have some wiggle room in my budget to purchase a pair of jeans or a few tops in a bigger size if need be. Sleep: Earlier this week my husband and I ordered from a restaurant and ate some tartar sauce that had been left out too long. Needless to say we were a little under the weather for 2 days and that really prevented me from getting a good night's sleep. By mid-week I was feeling back to normal and slept much better! Missing: Still nothing. Still loving every minute that I'm given during these 9 months. I couldn't be more happy. Loving: The fact that in just 3 months (or less) I will have a baby! It hit me the other day while at a fall festival with a friend that this time next year I will have a 9 month old to take apple picking, pumpkin patching, and strolling through fair food vendors with. Yay! Craving: Warm, home-cooked meals. My crockpot has been on blast the past 2 weeks. I've made several new recipes (not all with be on the blog because not all are "perfected" yet) and several home cooking staples that are much easier in the crockpot. Feeling: Much better now that the tartar sauce fiasco is out of my system. Starting to swell more so I'm a little nervous about my next doctor visit. I feel like it is very early for me to be swelling already. However, I am a teacher and I do stand on my feet all day so I can totally understand where that swelling is coming from. I'm trying to be better about sitting more and propping my feet up especially on my planning periods. Looking Forward: This weekend we are painting the nursery. I'm also going fabric shopping for curtains and such since that didn't happen earlier this week. Best Moment(s): Walking through the fall festival and finding several amazing, handmade toys for our bambino for fantastic prices! Call me an old soul, but I love the whole concept behind dolls and push toys and Lincoln logs and such. And handmade is right up my alley. Also purchase what I think is the last of the nursery decor for a fantastic price from Just Artifacts. Hoping I am pleased with the product! 2 of the toys I got baby boy at the festival. I am thinking his Christmas is done - and is it weird to you that I am having gifts for him under the tree just in case he decides to come early? Ummmm....I couldn't leave this chair at the festival! For the price there was no way it wasn't coming home for his nursery. My husband gets pictures like this while I'm out thrifting. I had run after school and then hit it up on the way home. I'm loving blazers and you can't beat a blazer for $3.50. That apple cider slushie was amazeballs. I said it. Can't wait to see some crockpot recipes. I am always looking for ways to do easy home cooked meals. I love going to the Good Will except I spend so long there. You can find great stuff there. It's going by so fast! I'm loving all the new items for baby G.
i want that slushie! and what a good deal on that blazer! isn't the hiccups the funniest feeling?? Love the blazer and that slushie sounds really good!